Just like your logo, you need to consider who and where your audience is. For instance, while Fort Worth and Dallas are often grouped together; branding in Fort Worth is different than branding in Dallas because the audience is so different. Contrary to what you may think, your branding goes beyond your logo. It influences everything you say and do. Your branding sets you apart from your competition and gives your audience a reason to buy from you instead of them. 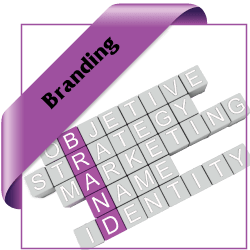 One of the keys to branding your business is to keep things consistent and cohesive. All of the pieces need to play well together and every piece of marketing needs to reinforce your branding message. Ideally you want to have a “smashable brand.” This means if any of your marketing pieces is pulled out on its own it will be obvious to your audience the piece belongs to you. If you’re looking at a completely defined identity and brand, these branding elements can also be included in your business identity package.